1. General plan of the Basilica of St. Peter, as Bramante designed it. This plan, commenced in 1513, was only partly executed; the architects who succeded him in the direction of the work made so many changes that, with the exception of the four great arches supporting the cupola, scarcely anything of the original design remains, and the idea itself would have been lost had not Serlio, his disciple, taken care to preserve the design. (Serlio, Libro terzo delle Antichità; Venezia, in fol., 1540, p. xxxvii. Bonanni, Historia Templi Vaticani, pl. x, p. 50. 6. Portion of the section no. 5 on a larger scale. 7. Detail of the entablature of the upper order. 8. One of the composite column between the pilasters of the second story. 9. Detail of the Ionic order of the ground floor. 10. General plan of the cloister of the Monastery of S. Pietro in Montorio, Rome, according to the design of Bramante, perserved by Serlio; the circular temple in the center was alone executed. 13. One of the Doric columns of the portico. 14. Details of the order. 15. Profile of the exterior entablature beneath the dome. 17. Profile of the interior cornice under the dome. 18. Detail of the Doric order in the interior of the temple. 19. One of the Doric pilasters of the interior. 20-22. 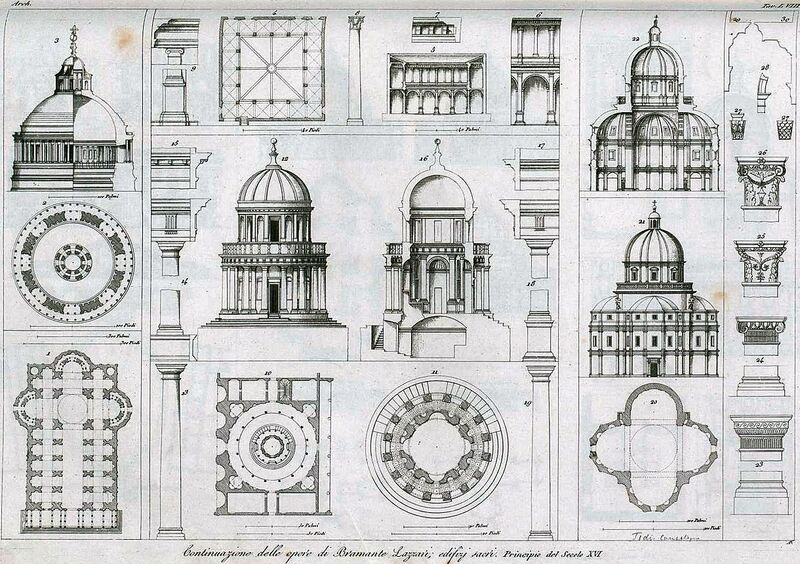 Plan, elevation, and section of the Church of the Consolation, built from the design of Bramante, near Todi. 23. Doric base and capital of the four great pilasters in the center of the church. 24. Ionic base and capital of the two orders of pilasters decorating the interior of the church. 25. Corinthian capital of the first order of the exterior decoration. 26. Composite capital of the second order. 27. Consoles serving as key-stones to the archivolts round the great niches. 28. Profile of the imposts receiving the archivolts. 29. Profile of the circular entablature above the four arches supporting the cupola. 30. Entablature over the four great pilasters of the interior.